Cooking with few ingredients is really simple, but many have the idea it won't taste good. The truth is , the vegetable is not overpowered by any masala and taste great with a touch of chili powder and salt! 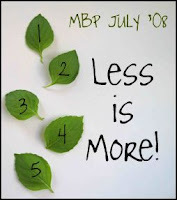 When Nupur announced less is more for this month MBP event originated by Coffee, it reminded many dishes in day to day cooking that my mom does. My mom uses only Kuzhambu powder mix (we call it Kuzhambu mix - red Chili , coriander seeds, turmeric, small amount of black pepper and cumin added along with few curry leaves). Those ingredients are dried in sunlight and ground in masala mill to make a fine masala powder. Yes, in India, we do have special mill for masala grinding! Vegetable are very delicate , cook fast and doesn't require any special masala. You can really enjoy the flavor of the vegetable when there is less ingredients involved. I got two recipes from my fellow bloggers, both are baked version. 1.The first one is Baked Bitter Gourd crisp picked from here . She has a collection of sweets too . 2.Next , it is Potato & Garlic Roast got it from en Vittu virundhu. Yes, it is real feast, she has some simple recipes collections. 3.The third one is simple toor dhal (my mom's recipe) - If someone has the same recipe, i would be glad to link there site here. This two side dishes go well with dhal. nice ones cham....food is really tasty even if it has lesser infredients..this event proves it!! Now that's the kind of meal that I dream about! Simple and delicious. Thank you for your participation! A complete meal with a handful of ingredients... - looks awesome chams. Nice entry for MBP. i simply liked it...and i fully agree with the theme..less is more. All my best wishes are with you ! Hey all three look delicious..wanna try the karela nad potatoes .. Delicious thali Cham, very nice recipes!!! CHam, the dal is such a coincidence, I made one like that a couple of days ago. I flavoured it with lime, though! Delicious platter with few ingredients thats interesting. Very good collectio for the event. great entry cham. Those are some real quick and easy delicious recipes... Great entries for the event Cham! Also, congrats to your niece, what an achievement! wow, delicious thali! Easy and yummy recipes. Yummy thaali... with few ingredients. Gr8. Dear Cham, You have a goodluck genie waiting for you on Cooking Station. Yum, bitter gourd. It's one of my favorite veggies and I can't have enough of it. Nice entries, Cham. great recipes with simple ingredients..this one I can try out. Thats just 4 ingredients for the potatoes and I love the addition of garlic! The thali looks so homely! These r soo good & make a happy meal. I love those Pavakkai crisps.. Yum Yum!! very simple meal cham at the same time delicious too..
i love chips and fries to the combination of sambar or dhaal. Cham, that's a nice menu! You toor dal is exactly made the way my elder sister loves it! Hi cham, That looks simple and mouth watering. Thanks for ur comments in our site. Nice entry and a perfect thali..would love to have that plate whenever i am tired or after a long travel.. I love both these vegetables, especially when they are crisp. Lovely. Love the thali Cham, Your pictures are always so wonderful. I'm eyeing the Potato and Garlic Roast....slurp!! lovely platter cham..I should try the bittergourd recipe..
Great post. I love to eat this with curd rice!! very nice thali, with few ingredients, apt entry for the event..